Hello Ladies and Gentlemen, Trevor here with a little SMTY Takeover. Why you ask? Well, with Mother’s Day coming up, Teddy and I wanted to do something extra special for Jennifer. 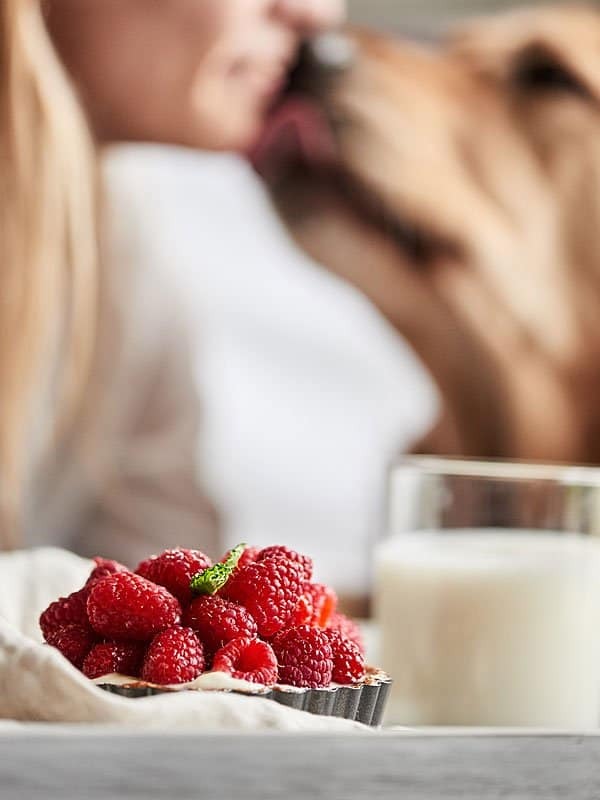 That’s where this absolutely delicious, so easy even Teddy could help, Healthy Fruit Tarts Recipe comes in. These ARE perfect for any human kids that want to help make mom something special that looks and tastes amazing! Wanna see how easy? Check out this video and you’ll see in sixty seconds. I don’t know about you guys, but Mother’s Day was always a favorite for my brother and I growing up. We’d sneak downstairs with our dad and whip up a gourmet breakfast. I mean, we’re talkin pancakes, eggs AND orange juice… so, it was a pretty big deal! If things really got out of hand, there may or may not have been a link or two of sausage involved. We’d then lay everything out on a tray, that I believe was only ever used on Mother’s day, and deliver our masterpiece to our mom waiting patiently upstairs. So, with Mother’s Day coming up, I wanted to pass the tradition on to Teddy. 4.) And… it had to be something that kids could help with if they wanted to. Four ingredients for the crust: cashews, raisins, vanilla (+ salt, but that hardly counts). Vanilla honey greek yogurt as the filling. And the freshest, most beautiful Driscoll’s Raspberries you’ve ever seen. Easy, healthy, seasonal, kid friendly… check, check, check, check! Pulsing the cashews, raisins, salt and vanilla in a food processor gives you the crust. 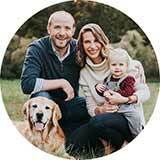 Everything from here, is totally kid friendly and fun! Press the crust into mini tarts, freeze the crust for about thirty minutes so it firms up, and fill it with honey vanilla greek yogurt. Heap on fresh Driscoll’s Raspberries, a sprinkle of powdered sugar, and if you want to get really fancy, top it off with a couple leaves of mint. BOOM! You’ve got yourself a breakfast fit for a queen. Or heck, this is even great as a dessert! Now all that’s left is the all important delivery. Throw it on a tray, plate, whatever you have, it won’t matter. Follow Teddy’s lead and give your Mom a kiss. Wish her a happy Mother’s Day. Then grab one of those Healthy Fruit Tarts for yourself! 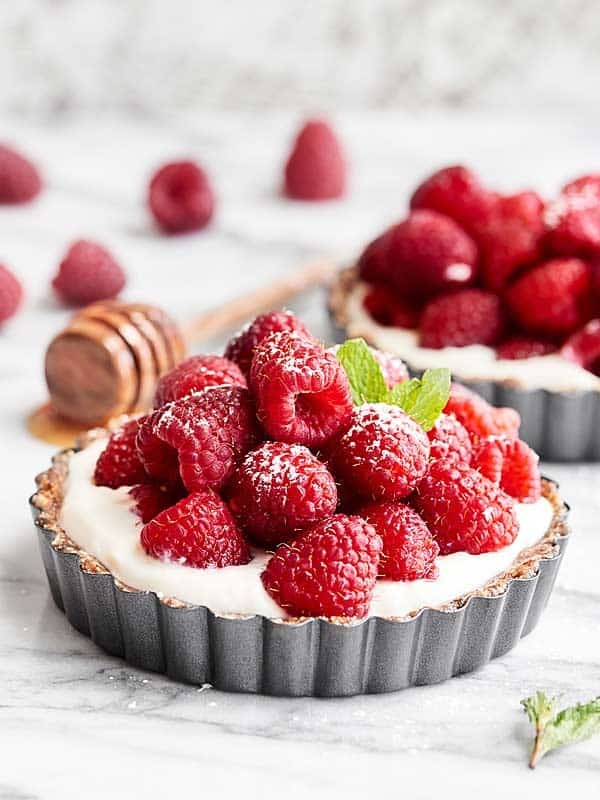 What’s your favorite way to use fresh raspberries? Show Me the Yummy! Need more raspberry recipe inspiration? 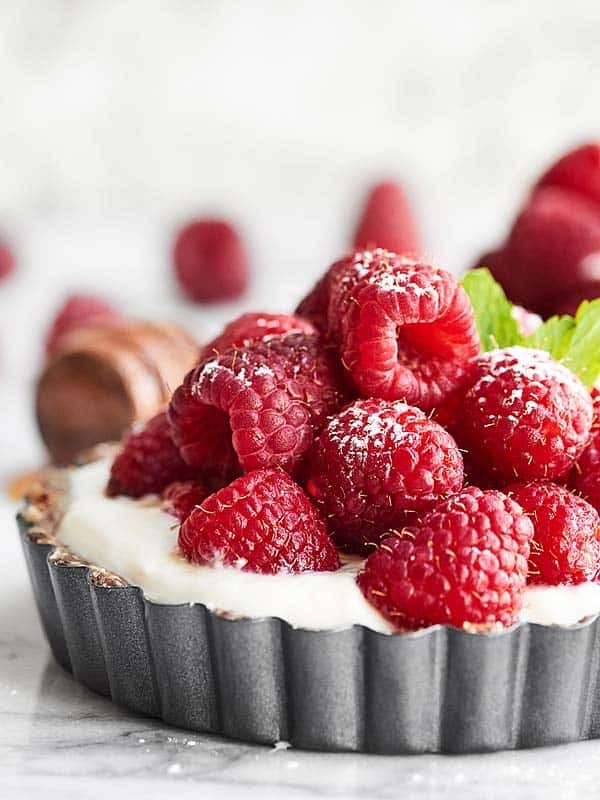 Check out Driscoll’s Raspberries Recipe Ideas! Also, be sure to enter their Sweetest Berry Sweepstakes for a chance to win $100 in Driscoll’s Berries! Only 5 ingredients (I don't count the salt 😉 ) are needed to make these Healthy Fruit Tarts! 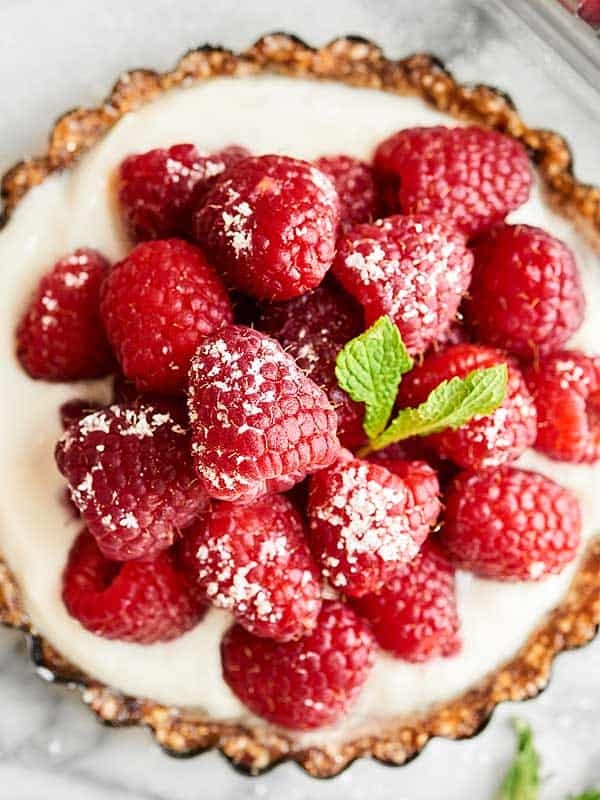 A simple crust made of cashews and raisins is topped with vanilla greek yogurt and loads of fresh raspberries. Healthy enough for breakfast, yet decadent enough for dessert! In a food processor, pulse together cashews, raisins, vanilla, and salt. It's ready when the cashews have broken down and the dough sticks together when you squeeze it together in your hands. Grease 3 (4.75 in) round tart pans and press the dough evenly into the bottom and sides of each tin. Remove the tarts from the freezer. Place about 1/4 - 1/3 cup greek yogurt into each tin. 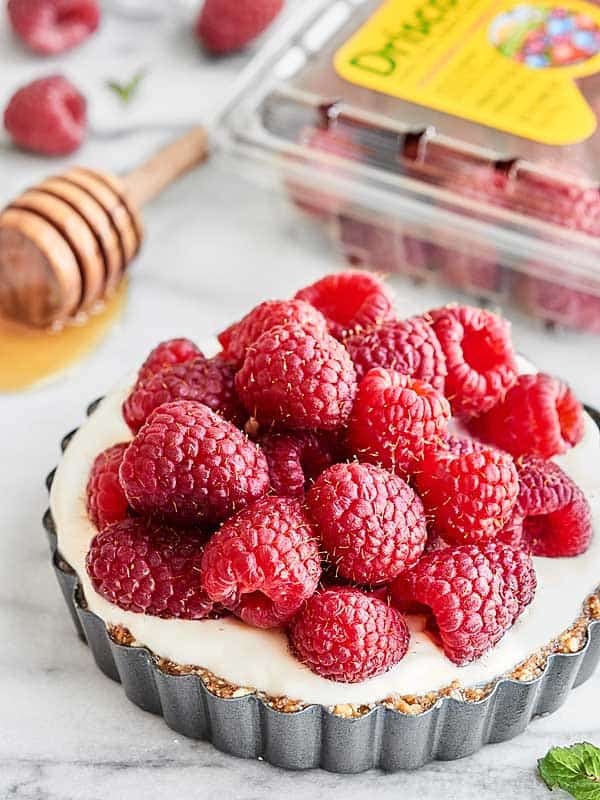 Top with raspberries and optional toppings! *I used raisins that I purchased the same day, but if you use older raisins (that seem really dry), you may need to soak them in warm water for 10 minutes, then drain and proceed with the recipe. **If you freeze for longer than an hour (say overnight), you may have a little trouble getting the tarts out of the tin. Just work with it for a second and they should pop out! Thanks again to Driscoll’s for sponsoring today’s post. We eat their raspberries like candy! Thank you so much Marina! 🙂 Hahahaha let’s be real, people follow us on snap chat FOR Teddy 😉 What’s your username on Snapchat? I can’t remember if I’m following you! 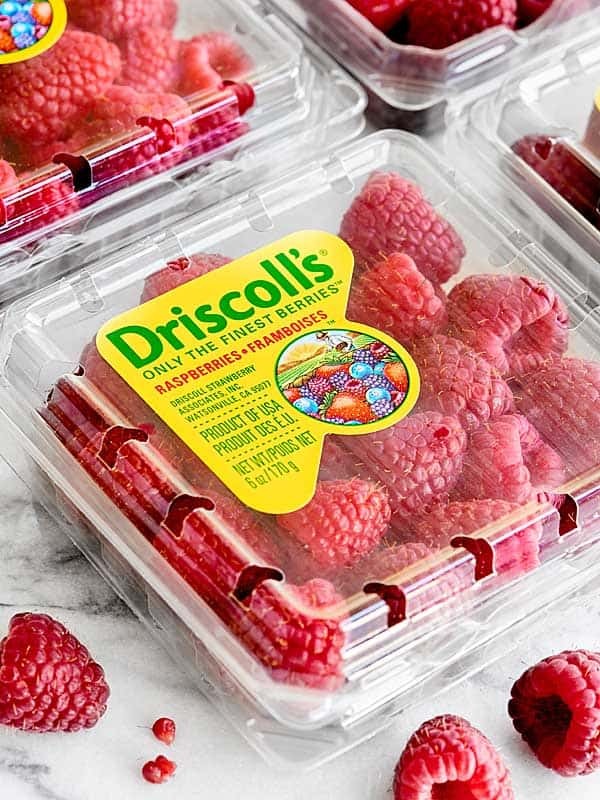 Yes, we <3 Driscoll's 🙂 Raspberries + greek yogurt & honey is perfection, but this is definitely a fun treat as well! Thanks Dawn!! 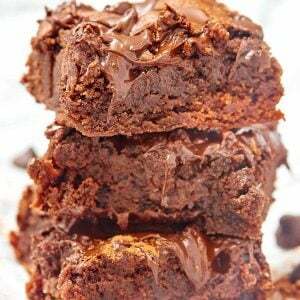 This is the perfect Mother’s Day dessert – I think I am going to leave this post up on my computer as a hint for anyone in my house passing by! So springtime gorgeous! 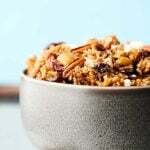 I’m not too crazy about yogurt but this recipe may just change my feelings! 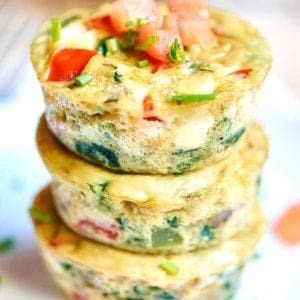 Quick, healthy and easy! Love it! Pinning! How sweet of you and Teddy to come up with a Mother’s Day treat for Mom! Those raspberries are absolutely stunning! Jennifer these look stunning!! I love greek yogurt based desserts and these are a beauty!! I can’t believe how easy these tarts are to make! And they look absolutely gorgeous, too! What a perfect dish for Mother’s Day and spring! So gorgeous Jennifer and so easy! The perfect spring/summer dessert! Love all your photos, as usual, especially the last one! Hahaha he’s the smartest!! Although I’m slightly biased 😉 He’s an only child, but I’m begging Trevor for another…maybe a Mother’s Day surprise? Thanks David! Ha! Yes. I’m glad we’re on the same page. 🙂 Thanks Demeter! These tarts are just gorgeous! Love that pile of fresh raspberries!! My favorite! These photos are stunning! Such a perfect thing for spring, and Mother’s Day, and I love that they’re guilt-free treat! Great way to use up raspberries! Love how healthy, delicious and beautiful this fruit tart is. 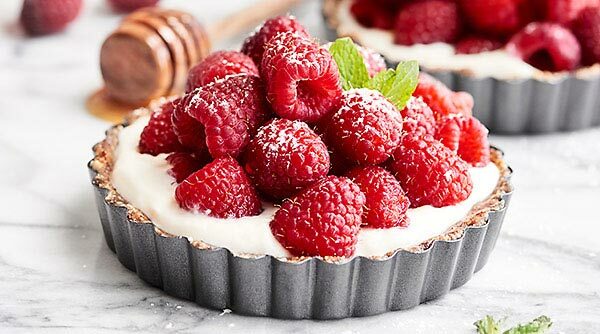 Those raspberry on top looks adorably yum! 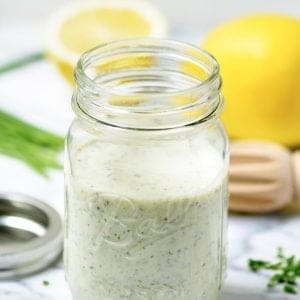 Such a beautiful little recipe! I just love the idea of making fresh fruit tarlets, they look so pretty and the greek yoghurt filling i bet is light, tangy and delicious. yum! Thank you so much Thalia!! SO glad berry season is here 🙂 Thanks Karrie! How many calories per tart? I’d recommend this nutritional calculator to figure out the calories: http://www.myfitnesspal.com/recipe/calculator I hope that helps!